Throughout the intermodal industry, further enhancing the driver experience is an increasingly important focus. Executive Vice President Doug Hoehn of Milestone Equipment Holdings stressed that the “most important thing to do for a motor carrier or drive is to provide a good piece of equipment,” and described technological and equipment advancements being made to accomplish that. “We have taken several steps that help customers and drivers know what equipment is available,” Hoehn said. One of them is an emailed daily utilization report that provides real time information. Another is accessing equipment supply through chassisfinder.com. Fleets and drivers can select equipment on the web or by phone. 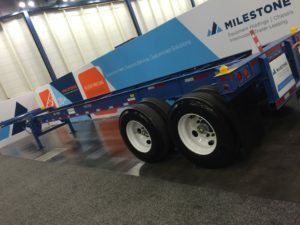 Another approach in use at some locations, Hoehn said, is equipping chassis with GPS to help managers better understand movement patterns so that utilization can be improved. Eventually, Hoehn believes that “GPS won’t be something that is an option, but will become almost required equipment” for chassis. Currently, Hoehn believes that upgrading to radial tires, disc wheels and LED lighting on all company chassis gives drivers the assurance that they won’t have a breakdown. Milestone chose that equipment to make its equipment more attractive to users, compared with the older chassis that might not have those features. Hoehn said the market is embracing newer chassis as ownership of equipment shifts more toward motor carriers, 3PLs, cargo owners and forwarders who are willing to pay slightly more for equipment with the belief that lower total cost of ownership will be the result. He also favors the trucker choice model.